In brief: A Google patent might be providing a good look at how the inclusion of a stylus will offer improved functionality in the future. As the patent details a stylus that’s equipped with its own wireless interface, memory and processor. The patent does not particularly emphasize the need for a stylus to contain all of these at the same time, although it could do, or a combination of them depending on need. What’s more integral to the patent, is the notion these components will allow the stylus to copy information from one device to another. The patent was technically first filed by Google back in 2016 with the World Intellectual Property Organization (WIPO) although it has only this week been granted. Which highlights how far back Google has been considering additional use cases for pen-like accessories. In terms of the patent, the descriptions are a little rudimentary in this respect as while the idea is to transfer data from one machine to another, this is almost exclusively described in terms of copy-pasting. For example, a user will be able to highlight text on a computer, send the highlighted data to the pen, then use the pen to send and paste the same text to another machine – like a smartphone. Or of course, vice versa. Background: Google is not new to styli as the company did make available a “Pixelbook Pen” (shown above) with the original Pixelbook Chromebook. More recently, the company also announced a revised model to coincide with the launch of the newer Pixel Slate Chrome OS-powered tablet. Although in reality, besides the availability of a different color option, there is very little difference between the two generational pens. That said, both pens do already feature a number of advanced features which may be early indications of what is now described in this latest patent. For example, the current Pixelbook Pens feature a tighter integration with Google Assistant where the user can hold down a dedicated button on the pen while circling or highlighting something to get feedback from Google Assistant on a target word, phase, image. So while it is already possible to get feedback on highlighted text, the new patent alludes to the likelihood a Pixelbook Pen would be able to manually copy the same text and send it to another device. What’s more, it could be the case that the technology will support copy-pasting to any other device, not just those running on Android or Chrome. The reason this last point might be possible is due to the Universal Stylus Initiative (USI). As in what seems to be highly unlikely to be just a coincidence, Google was confirmed as a new member of the USI back in January of this year. 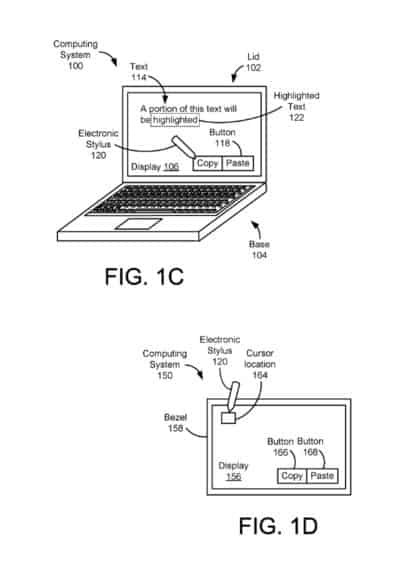 Like the Google patent described here, the USI is an initiative that has been in development for a number of years and supports an open active stylus standard where a stylus can work across different devices, and according to the USI, “across make, model and form-factor.” By the same token, the specification also means more than one stylus can be used on the same device at the same time. Google is not alone in supporting the USI either, as the same January announcement detailed the initiative now has the support of more than thirty different companies. So while Google and the other members of the USI look to bridge the gap between devices to ensure a stylus can physically interact with different devices, it would seem Google is keen to build on that support even more through the transmission of data across supported devices – again, irrespective of make, model and form-factor. Impact: The use of a pen which can copy-paste information is fairly self-explanatory. However, the patent name — “Electronic stylus for storing credentials” — is a little revealing in itself as it suggests Google might position this as an improved security feature where users can quickly sign-in to other devices by using information gathered from another device and stored on the pen. A point which is reiterated in the description where Google talks about a stylus not only featuring a wireless interface but also a Trusted Platform Module (TPM) which will in effect help to encrypt the information stored on the pen. Thereby making the transmission of credentials a safer process. Elsewhere in the patent, Google reiterates this type of example use case by specifically highlighting that not only will the authentication credentials stored on the stylus offer the option to log into a different computer system, but it could also be used to log into the same computer system the user originally extracted the credentials from. In principle, the user could always log out of a computer at the end of each session and quickly and easier use the stylus to log back in each time. While the ramifications of this patent are minimal in the sense that Google seems to be primarily talking about copy-pasting, that is likely to only be the start of the support and it’s conceivable as time goes on and the technology evolves, the scope of what a stylus could technically store and transmit to different devices could grow immensely. In the grander scheme of speculation, it could come to a point where a pen-like device could store and recall when needed full documents, and more. To the point where a user might only need to carry a pen with them and still have access to a wealth of digital data and especially if the data is sensitive enough to opt out of cloud-based storage. 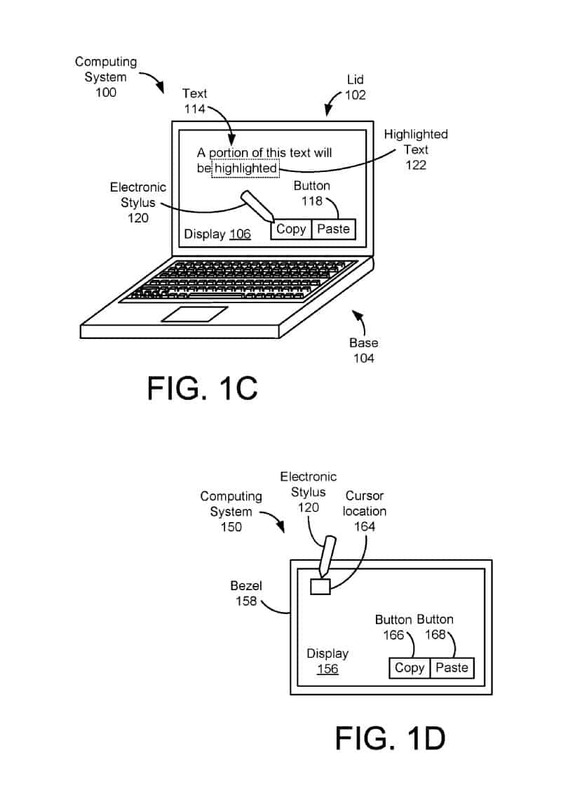 The patent very briefly touches on these additional features by suggesting that in addition to storing text, a stylus could also store ‘states’ with examples given by Google including “a particular webpage,” “contents of a cache of a web browser” or “contents of an application.” Of course, as is always the case with any and all patents, the existence of one, granted or otherwise, is not in any way a confirmation of an upcoming product, service of feature, let alone one that can be defined exactly as described. 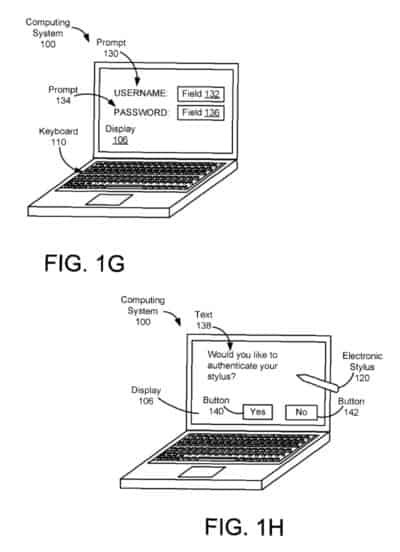 Although, the existence of this patent, along with the recent support for the USI does suggest this is a stylus feature Google is actively considering. You are reading an article on the Google Stylus That Transfers Data Between Devices Described In Patent. All materials on the site Gadgets F, а также и статья Google Stylus That Transfers Data Between Devices Described In Patent - written for the purpose of information enrichment and we are happy if you like our magazine.